Now let’s give it some muscle. Ginger and carrots are flavour pals, so let’s add some ginger too. This will also help with any waves of nausea and fight inflammation. 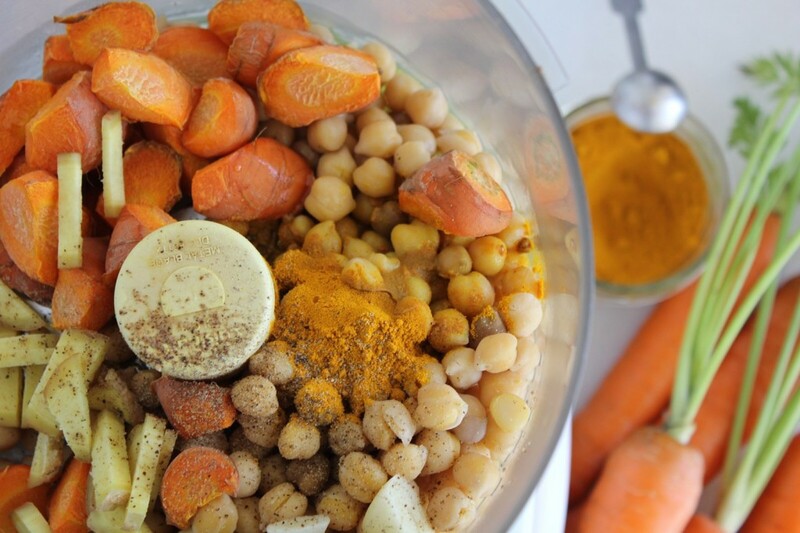 Since we’re talking about anti-inflammatories, let’s not forget to add some turmeric. Not only is it the spice leader in this field, but it also tastes great with ginger and garlic. Natural. Not forced. 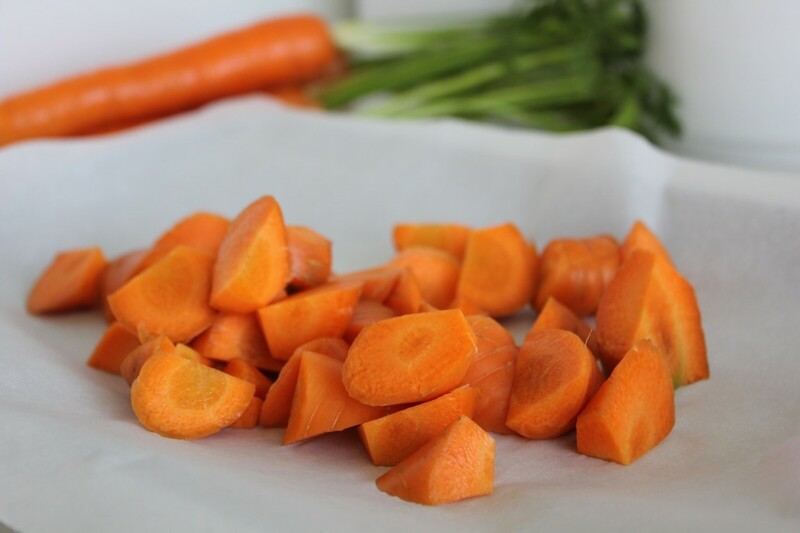 And maybe we should roast the carrots to up their beta-carotene content and to soften them so that they blend well with the chickpeas. Now let’s talk garlic. The only thing that can sometimes make me hummus-shy is a garlic-happy chef. These well-meaning chefs have garlic enthusiasm to spare, and although I share with them their enthusiasm for the abundance of health benefits in raw garlic, I have my raw garlic tolerance limits, and I know some others do too. If you can handle it and think I’m crazy, by all means, throw in lots of fresh garlic and take comfort in knowing that your risk of lung cancer will be lowered. If you share my curly garlic feelings, throw ½-1 clove of fresh garlic into the hummus to keep some of the raw garlic benefits, and put the rest of the garlic into your chickpea cooking water and simmer it away with the chickpeas (along with a beefy sheet of kombu for minerals and easier digestion). The garlic flavour will mellow out as it cooks but will still impart its garlicky wisdom. 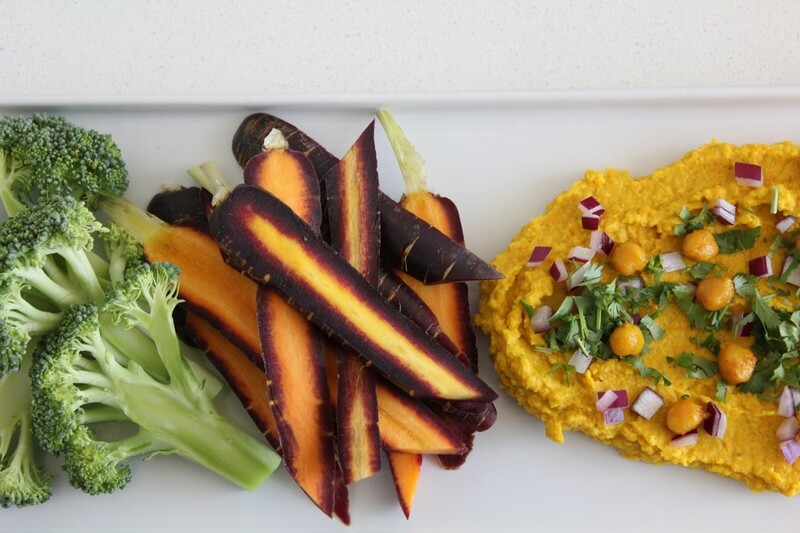 It is important to notice where we can add some extra ‘super foods’ in a way that fits naturally from a taste perspective, and this hummus is a good example of that. This will not likely replace classic hummus in your life. That would be like replacing your I’m-not-leaving-the-house-today sweat pants. No competition. But it will mix things up a bit. 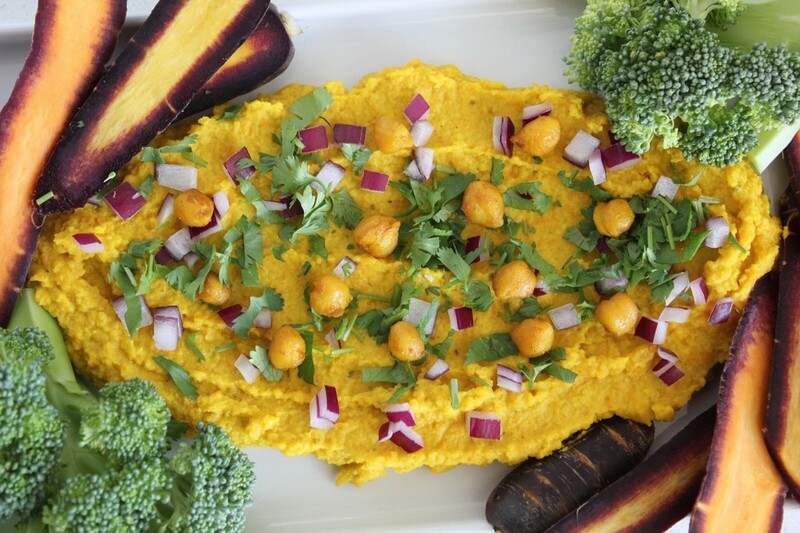 And maybe the sweat pants hummus could use a pinch of turmeric a little more often. Or some roast carrots. Think about it. Enjoy this however you enjoy everyday hummus (off of a spoon), or spread out a layer of it on a platter, and garnish with some diced red onion and cilantro (again, GREAT for the cancer thriver but also logical from a tasting awesome perspective) with some fresh veggies (get creative –fennel sticks! thinly sliced beets! Purple carrots!) 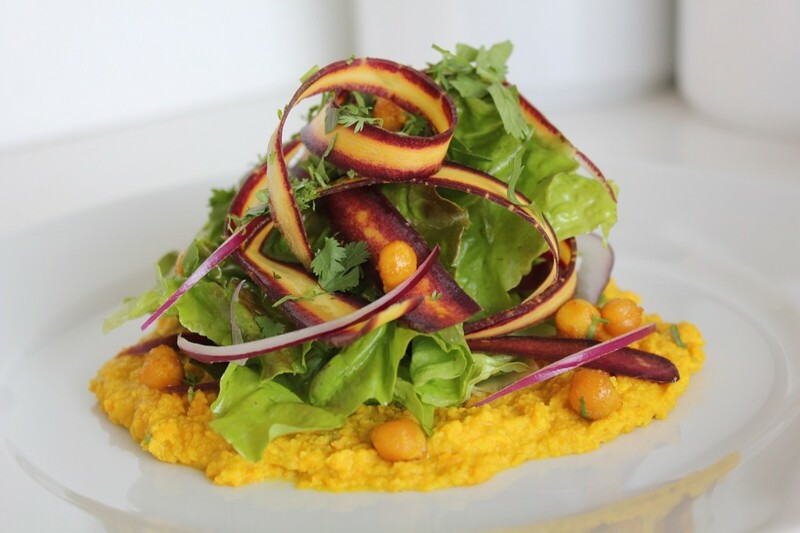 Or serve it in my favourite (lazy) way to make a salad a meal – smear some hummus on the bottom of your plate and top with a simple salad. It makes an easy, healthy (and kind of fancy?) lunch, even if you’re enjoying it from a glass container at work. 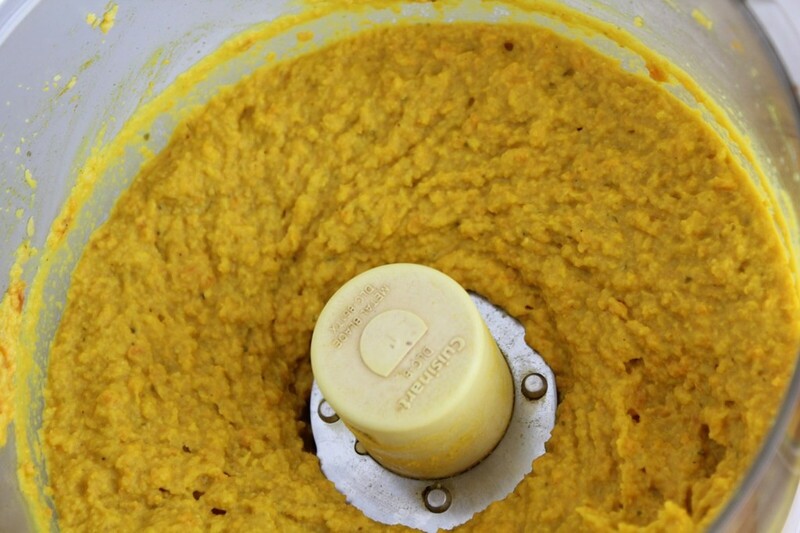 Put all of the ingredients except for the water into your food processor. Blend up, adding the water as needed, until desired smooth-ness. *Note: The coconut oil will tighten up the hummus once refrigerated (because coconut oil hardens at cooler temps). Either add a little extra water when you make it if you know already that you will be eating it right out of the fridge, or bring it to a warm (microwave-free) room temp before serving it. You could also use extra virgin olive oil in it's place, but the coconut oil flavour is at home here, and that rarely happens.